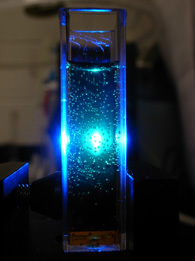 Bubbles form during water oxidation, catalyzed by the new tetra-cobalt WOC. Photo by Benjamin Yin. Emory University chemists have developed the most potent homogeneous catalyst known for water oxidation, considered a crucial component for generating clean hydrogen fuel using only water and sunlight. The breakthrough, to be published in "Science" and released online by the journal March 11, was made in collaboration with the Paris Institute of Molecular Chemistry. The fastest, carbon-free molecular water oxidation catalyst (WOC) to date "has really upped the standard from the other known homogeneous WOCs," said Emory inorganic chemist Craig Hill, whose lab led the effort. "It's like a home run compared to a base hit." The WOC research is a component of the Emory Bio-inspired Renewable Energy Center (EBREC), which aims to mimic natural processes such as photosynthesis to generate clean fuel. The next step involves incorporating the WOC into a solar-driven, water-splitting system. View more information on sustainable energy research at Emory and EBREC. The long-term goal is to use sunlight to split water into oxygen and hydrogen. Hydrogen becomes the fuel. Its combustion produces the by-product of water - which flows back into a clean, green, renewable cycle.